Forget Archie Meets The Punisher, if it got any better than this panel, drawn by Alan Kupperberg from a story that appeared in Cracked Super #11, then I don't wanna know. 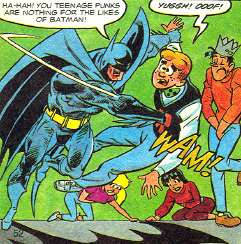 I love how everyone gets thumped in the guts, yet Jughead has clearly taken a shot to the nuts. Just thought I'd get the weekend off to a decent enough start. It was one of the biggest and most controversial events in comic books for it's era. The death of Batman's trusty side-kick, Robin. And even worse, the general public got to vote for the poor guy to live or die, and the end margin was a handful of votes for Robin to meet the reaper. The reaper, in this case, was Jim Starlin. When Is Original Art Not By The Original Artist? When is original art not drawn by the original artist? When it's been totally redrawn by another person for whatever reason. 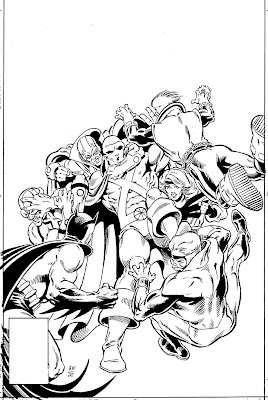 The art you're seeing on the left in this post is the original cover art for the Justice League Annual #1. According to the Grand Comic Database, the cover was penciled by Bill Willingham and inked by Joe Rubinstein. Funnily enough there's people who know that those credits aren't entirely the truth. You see, although Willingham did pencil (and ink) the original cover, the final product wasn't his work at all (as an aside, I like Willingham's work and wish he was used more in mainstream comics). This weekend has found us at the Giant CD, Record and Comic Book Fair at Wayville. Normally it's a damn good time for us as we're able to connect with people, sell some stock and buy even more, but the last few times have been woeful in every category. It's a three day event, however for the last two years we've cut that down to doing only two days - seriously it's not worth it to sit there for half a day on the Monday only to sell about five comic books, even if it's free. I'd much rather be at home.